Scarlett’s stunning portrait pictures have long been a highlight of many a Facebook feed. Homages to various villains, they can make other artists seem more drab than drag. Now Scarlett is offering to teach Joe public how to get the look. How did you become Scarlett? I originally wore make-up to beat the bullies. I went to junior high school in Niigata prefecture. I was a transfer student who loved flashy things and visual rock bands and the other students bullied me, calling me a ‘weird gay’. Rather than crying, I dared to start going to school with make-up on to provoke those students further. 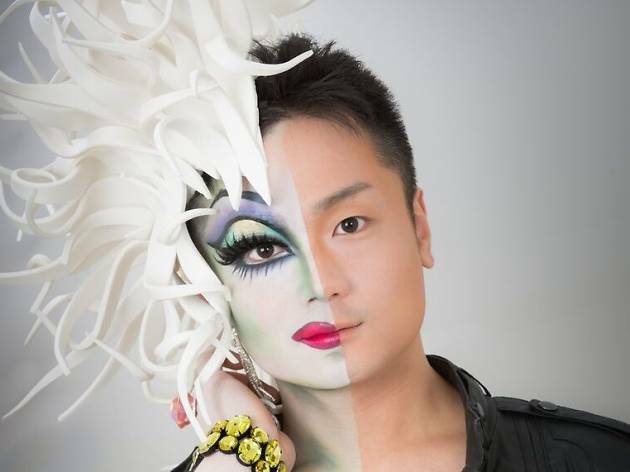 Then, when I was a university student at Kyoto University of Art and Design, I joined the oldest drag queen party in Japan, ‘Diamonds Are Forever’, as a performer. I hadn’t actually realised I was homosexual then, but it was very natural for me to be a drag queen. When did you start offering makeup lessons? After I came to Tokyo in 2012. I have a friend who is a burlesque dancer, and I taught her how to draw double line [one of the eye cosmetic techniques used by drag queens]. It was a hit on stage, and soon other dancers were begging me to teach them too. That’s when I started offering lessons. What is special about your lessons? Everyone knows that stage make-up should be applied thickly, but there were no professionals teaching people how to do it effectively. Most performers, including drag queens, pick it up by themselves by following their seniors’ example. I am not a make-up professional, but I have a background in art – I graduated from an arts university and I have taken art classes since I was little. You can think of my lessons as a painting workshop, with people using their own faces as a canvas. Since no two people have the same face, it isn’t very easy to follow the directions in a beauty make-up book. I approach each face differently – once my students get the basic function of each make-up, they can become self-reliant, both for the stage and for everyday looks. Do you still have time to perform on stage? I only really take to the stage at Halloween these days, when my exaggerated style is really in demand. When I get myself on stage, I try to offer an original show that nobody else can do. I never compete or compare myself with other performers. I produce every element of the show – I think that is the indispensable etiquette of an entertainer. You can also make costumes. What do you take into account when making outfits? When it is for other people, I will listen carefully to their requests and make it durable to enable them to wear it many times. In the case of my own costumes, I will make them look expensive and gorgeous no matter what. Even if the materials are nearly cost free – and I have used black plastic garbage bags before – no drag queen should look cheap. In the near future, I will continue developing the make-up lessons. As for my dream, I would like to release my portrait collections in some way. I actually look better in stills than when I perform. [chuckles] Don’t you think ‘drag queen tarot cards’ could be interesting?